Gentlemen (and Ladies!) . . . Start your engines! SHOULD YOU CARPOOL DOWN LOVER’S LANE? BE VERY SELECTIVE: If you’re letting someone inside your car, it’s like being with every single person they’ve ever driven with before you! Which often leads to becoming . . .
A NON-DRIVER: There are other perfectly good modes of transportation like the subway, biking, or walking. Even rollerblading can be fun solo. DRIVER’S TRAINING: You’ve had your license for years now and this isn’t your first time circling around the block, but the rules of the road may have changed and who knows, it could be a rebuilt motor this time with extremely rare, hard-to-find parts! Take courses, read books, and google, “Better communication skills.” This will go a long way to preventing totaling your vehicle in a serious crash. TRUNK: This can be the most dangerous part of a car and if you’re embarking on a trip (thru life!) with a new carpool partner, I see nothing wrong with requesting them to remove their baggage from the trunk before you start the ignition. Just politely ask to open up their luggage for inspection. I’m not saying to screen like TSA security does at the airport, but if there are some major causes for flat-tires zipped up tightly in a side compartment of one of their suitcases, it’s best to find out early on. (Always carry a jack and a lug wrench just in case.) Better yet, offer to unpack your baggage first. There! Isn’t that freeing? GEARS: Don’t shift too soon or too fast because you might pop the clutch, throttle the relationship, or permanently stall out. Seriously, where’s the race? If the spark-plugs are in good working order, and the entire electrical system is obviously functioning well, I’d suggest coasting in neutral until you make sure passenger and driver are making a smooth automatic transmission together. If I were a BMW (Beware Men/Women!) dealer, I’d recommend for optimum performance, waiting 3-4 months before implementing the pistons and cylinders. The internal combustion you’ll experience if you delay using these parts will be a power-boosting propulsion system like no other! If you MUST shift into overdrive early on, at least use a seatbelt for protection. HITCHHIKERS: This is simple. Just don’t ever pick ANYONE up on the side of the road. The last thing you need is either of your mothers or “well-meaning” friends, siblings, or children along for THIS ride! HEATING OR AIR-CONDITIONING? : Okay, this is where all the car metaphors come to a screeching halt! Real life advice here, because this topic will make or break your relationship faster than you can google, “What’s Considered Normal Room Temperature?” And if it’s not settled before you climb between the sheets, those sheets will be flying on and off the bed all night long. So decide now…..does your engine tend to run better warm or cold? STEREO: Keep an open mind and don’t have too many preset radio stations. And for goodness sake, don’t keep pushing all your driver’s buttons. And don’t immediately reject an 8-track or cassette player because you may be dealing with a classic chassis, the value of which is not immediately apparent. HAZARDS: Don’t put yours on. Nobody else on the street needs to be alerted with flashing lights if you’re experiencing driving difficulties. Go down a private road! REAR VIEW MIRROR: She’s not gonna be real happy if this is the angle you’re constantly focused on. HORN: I wouldn’t be constantly tooting your own if I were you. GPS: The end destination is not the point, it’s how well you follow directions! 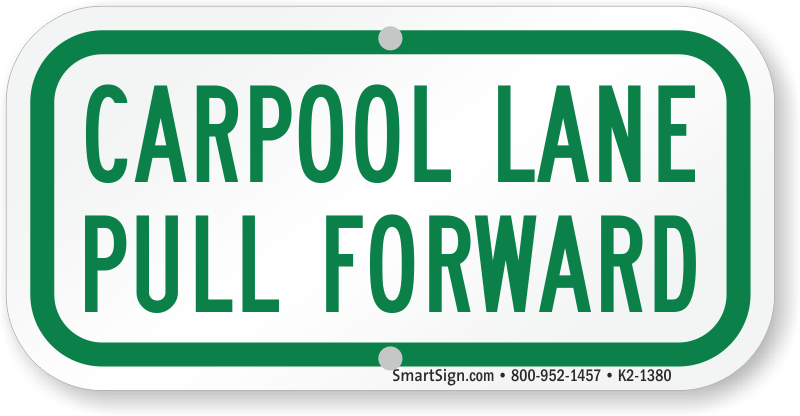 Signal well in advance if you change lanes so you don’t cut anyone off. And no sudden U-Turns if you change your mind. Just tell your driver you’re carsick and ask to be let off in a well-lit safe area on the side of the road, and thank them for the lift thus far. YOUR MILEAGE MAY VARY: But if you keep passing by all the exits (even though your low fuel indicator icon has ominously lit up!) that’s probably a good sign you want to run out of gas with this person forever — and your relationship gets the green light to accelerate. Now you should Merge carefully together out of oncoming traffic and avoid going near your local DMV(Divorce/Mediation/Victim). ← Are You Out There? I Imagine You Are . 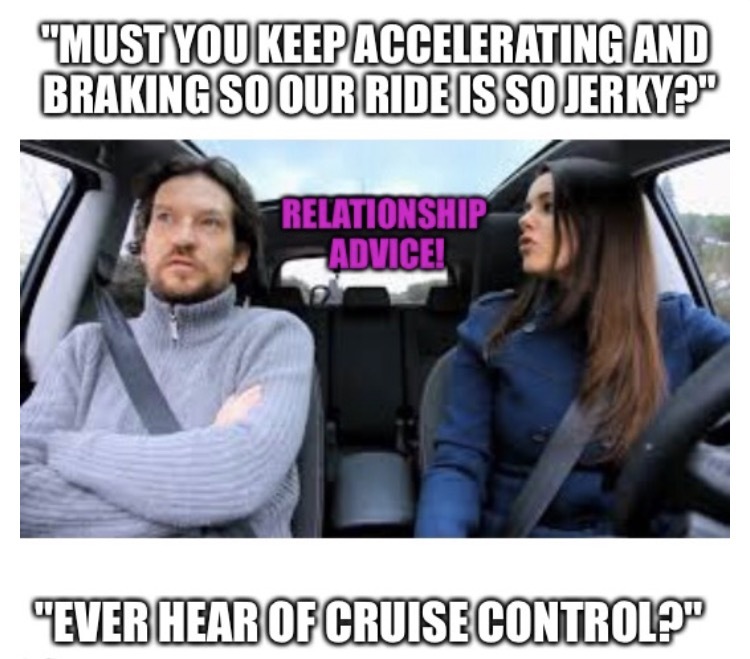 . .
Driving like many couple activities test the bonds of your relationships…. my advice – do everything you can do separately , separately. I’m more the kind that never turns my blinker off. What do you think that means? Perhaps the car you choose makes a difference, too! Fast car? Luxury car? Is it possible the car/ relationship requires a lot of maintenance? Sometimes, I just hope I don’t lose my relationship license!